​Good Housekeeping, and Time Out New York Kids. Her writing has since appeared in lifestyle publications like Real Simple and New York Family, and digital outlets such as Yahoo and MSN. 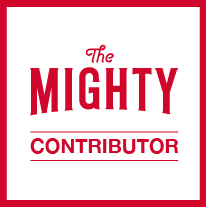 She frequently contributes to The Mighty, an online health community that also named her one of 2018's top chronic illness advocates. Kat is a graduate of NYU's Gallatin School of Individualized Study. She lives in Michigan with her two favorite guys: Mike, and their ridiculously adorable rescue dog, Doxon. ​At the age of 15, Kat contracted a bacterial infection in her ear and skull. For eight weeks, she administered antibiotics through an at-home IV (which she styled with the likes of a tie-dye soccer sock). While she successfully battled the infection, the high dosage of antibiotics wiped away her balance system, leaving behind a neurological disorder called oscillopsia, which she challenges you to say five times fast. Kat now swerves through life as a permanent "wobbler". In her spare time, she's recovered from 14 surgeries and lives with chronic, daily migraines...which are a real treat. ​She keeps her sense of humor (and sanity) thanks to an incalculable amount of coffee and brightly colored headbands. Oh, and words. Kat's debut picture book, SURGERY ON SUNDAY, will be published this fall. Interested in working together? Have a mind-blowing recipe for the perfect breakfast burrito?